We kick off the start of Year Two of the Roll For Combat Podcast with a special interview edition! 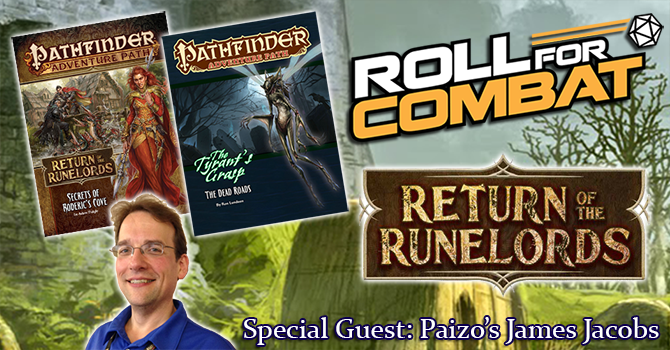 Today we sit down and talk with Paizo Pathfinder Creative Director James Jacobs about all things Pathfinder. With the release of the new Pathfinder Adventure Path, Return of the Runelords, we discuss the history of the Runelords and the first book in this Adventure Path, Secrets of Roderic’s Cove. We also discuss several other topics from James’s long career including the creation of the Adventure Path concept from his days at Dungeon magazine, his work on Age of Worms, Red Hand of Doom, Expedition to the Ruins of Greyhawk, Burnt Offerings, what to expect from the upcoming Pathfinder Adventure Path The Tyrant’s Grasp and even a little bit about the first Adventure Path for Pathfinder v2. Check it out!